A slow-paced intimate tale of the eroding inner torture that comes from telling hurtful lies to keep dark secrets. Made for fans of films that deal with inner conflict and teach new cultures. Rated NR - most likely restricted for language and brief violence. The Eskimo lifestyle in Alaska is far different from the traditional American lifestyle that most of us are used to. On the Ice promptly begins by throwing you into their culture feet-first. In the “land if the unsetting sun” (for several months out of the year, anyway), snowmobiles are the most used form of transportation. Men travel in large parties, going long distances to hunt their food – in this case, seal. It is an extremely rare occurrence for teenagers to leave town and go away to college. Our central character, Qalli, is one of those rare cases. Although Qalli and his best friend Aivaaq run around with the troublemaking teens of the town, they are different. Qalli comes from a good strong family. His father is basically the head of the local law enforcement. Qalli is only four months away from going off to college. On the other hand, Aivaaq is damned. He doesn’t know his father, his mother is a drunk and he is stuck taking care of her. Aivaaq is a victim of circumstance. He will never go anywhere and nobody expects him to. Qalli is the strong foundation keeping Aivaaq from becoming like the rest. Early one morning, Qalli is to meet Aivaaq and James – one of their riffraff peers – over a dozen miles from town out on the ice for seal hunting. Following their snowmobile tracks, as Qalli gets within eyesight of the others, he notices something odd – James’ snowmobile is on its side and Aivaaq and James are duking it out. As Qalli speeds to break it up, Aivaaq pulls a knife on the shovel-wielding James. A shovel blow to the side of the heads knocks Ivoc out just as Qalli removes the knife from Aivaaq’s hand. When James moves in to batter the unconscious Aivaaq, Qalli tries to stop him, but both lose their footing and slip on the ice. In the fall, the knife in Qalli’s hand accidentally sticks James in the neck, causing him to bleed-out and die almost instantaneously. When Aivaaq comes-to, he sees James’ still body and a pool of freezing red blood. 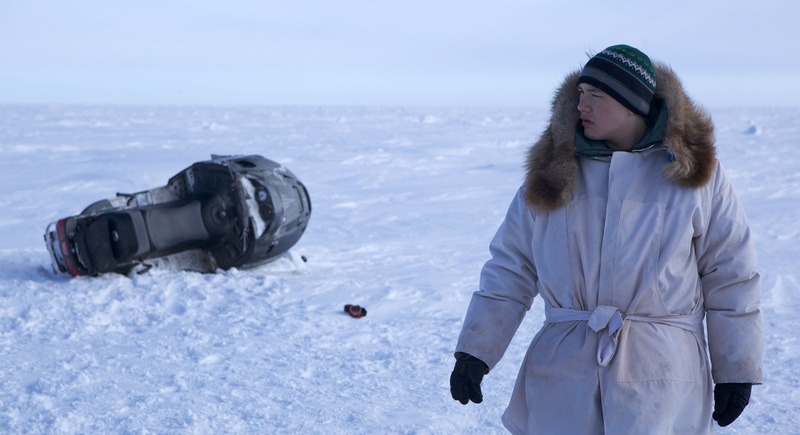 Since the last thing he remembers is charging James with his knife, Aivaaq automatically assumes that he is guilty of the killing. Saving himself, Qalli never tells Aivaaq the truth, leaving Aivaaq to believe he killed James. Both quickly slip into self-preservation mode and clean up their mess in the worst way. Qalli scoops up and bags all of the icy red snow and Aivaaq ties James’ body to his snowmobile and pushes it into an ice hole. When the two get back to town, they tell Qalli’s father that thick fog caused James to accidentally ride off the shore. As both Qalli and Aivaaq get caught in a rut of constantly making new lies to fit their story, each goes through different mental torture. Aivaaq deals with the anguish of killing a good friend, watching James’ family deal with the loss – a burden only made worse by not having a body to bury and give the family closure. Qalli’s inner battle is made tougher as he watches Aivaaq fall apart under the unnecessary guilt. Although not the most entertaining film of the festival, On the Ice is an emotionally-charged, deep and honest exploration of the human mind under terrible circumstances. It is smart, realistic and beautifully shot and acted.